It's 1996 and 12 year old Johnny Maxwell and his friends, Kristy, Yo-less, Bigmac and Wobbler find growing up in Blackbury, England somewhat dull. Things begin to liven up after they discover the local bag lady, Mrs. Tachyon, semiconscious in an alley. After calling ambulance and saving Mrs. Tachyon, the group decides to safe guard her shopping cart containing all her worldly possessions. This includes one vicious cat by the name of Guilty and a collection of black garbage bags, which rumor has it may contain the various pieces of poor Mr. Tachyon. Johnny soon discovers that the contents of the bags are even stranger. It would appear that Mrs. Tachyon has been collecting time and has in effect succeeded in unintentionally turning her shopping cart into a time machine. After a few tentative experiments with the bags, the group accidently transports themselves back to 1941 and just in time for the Blackbury Blitz. The bombing raid destroyed residential Paradise Street killing 19 local residents. The loss of life was even more tragic since Blackbury wasn't the intended bombing target, but rather a near by industrial town. Johnny being somewhat of a local history buff is convinced that something should be done to warn the residents and avert the loss of life. With Johnny and The Bomb, author Terry Pratchett has proven once again that he's a more than capable writer and story teller even when he strays from the familiar territory of his Discworld series. Johnny and the Bomb is the third in a series of novels that seemed pitched at early adolescents, but will surely entertain young and old alike. Pratchett succeeds in making the subject of time travel accessible, using the the young adolescents and their knowledge of time travel from pop cultural references such as film and books as starting point. Before you know it, Pratchett has managed to add a number of layers of more complex concepts on top while keeping the story fun and light. For example, at one point in the novel Pratchett describes alternate universes as being the "other leg of the trouser". That is a parallel world split off from a common point. Pratchett challenges a number of preconceived notions about time travel through out the novel including the nature of fate and the concept of paradoxes. In the end Pratchett succeeds in disarming many of these preconceptions by effectively suggesting an alternative and convincing the reader with an equally brilliant argument. Essentially the job of any good writer. He also manges to address the issue any time traveller intent on changing the past must face, How do you convince someone you know what is about to happen? I also appreciated Pratchett's ability to alternate between humorous takes on time travel and serious introspection on the nature of time. As an example of the humorous side, occurs early in the novel when Kristy realizes that the shopping cart may indeed be a time machine. Confronting Johnny with the knowledge results in the his incredulous argument that a real time machine would have flashing lights. An example of the serious tone of the novel occurs when Johnny later reflects on the nature of time and time travel. "Everything's there waiting. Johnny thought. That's the thing about time. It doesn't matter how long it takes to build a time machine. We could all die out and evolution start again with moles or something, it could take a million years, but sooner or later someone will find out how to do it. It might not even be a machine. It may just be a way of understanding time what time is, like everyone was scared of lightning and then one day someone said, look, you can store it in little bottles then it was just electricity. But it wouldn't actually matter, because once you had worked out how to use it, everything would be there. If someone ever finds a way of travelling in time, ever, in the entire history of the universe they could be here today." I highly recommend Johnny and the Bomb, as good introduction to time travel and Terry Pratchett in general. At just over 200 pages this is a light read and well paced. 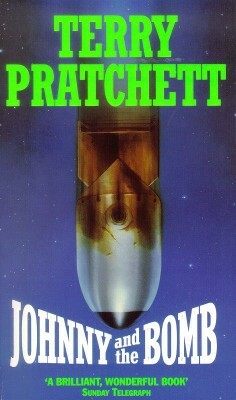 Terry Pratchett's Johnny and the Bomb was adapted in 2006 by the BBC as miniseries for their Childsplay Television series, see link below. The offical BBC site for the television adaptation of Johnny and the Bomb, with cast bio, synopsis, and some related Terry Pratchett info. The offical Terry Pratchett site with information about the author, his hugely popular DISCWORLD series, as well as his other books including Johnny Maxwell series. Includes links to other sites, news about author signings, etc.